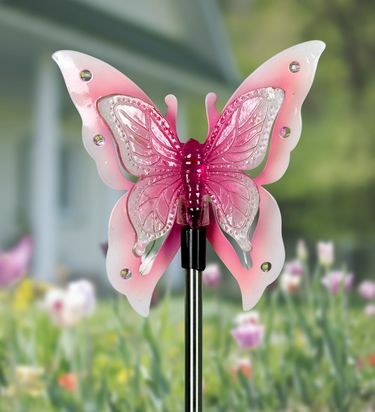 This illuminating Pink Solar Butterfly Garden Stake adds beauty by day and sparkles by night! Watch as 12 LEDs automatically glow at dusk offering an enchanting decorative light. This charming stake is sure to add the perfect touch of magical whimsy to your garden! Made of durable acrylic and metal for long term enjoyement. Size: 4" x 2.5" x 34" H.